Our nation’s Founders, in their wisdom, created the Electoral College as the method for electing the President of the United States. It is the Electoral College, not the nationwide popular vote, that determines who occupies The White House. 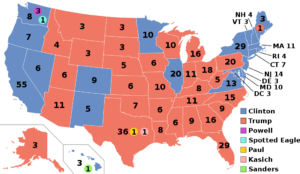 Donald Trump won the Electoral College in 2016 by a vote of 304 to 227. This was one of several instances in history where the winner of the Electoral College was not the top vote getter in the popular vote. George W. Bush was elected President in 2000 in a similar scenario. The Socialists in our country want to get rid of the Electoral College, even though it is a part of our Constitution. They are working on a state-by-state basis to eradicate the Electoral College and replace it with a nationwide popular vote to determine who is the President of the United States. This is driven by the fact that their losing candidates like Al Gore and Hillary Clinton were just that … losers. Progressives want to change the rules because they often cannot win when they are forced to play by the rules. It is one of many examples of liberals showing disdain for the United States Constitution. We need politicians in Michigan to stand up for the Electoral College as it exists. State Legislators have to resist efforts to amend the Constitution that would eliminate the Electoral College. To amend the Constitution would require ratification from 38 state legislatures. Therefore, it’s not enough to simply elect a Republican majority to our State House, we need to elect Constitutional Conservative Republicans. If the Presidential election were to be decided by a nationwide popular vote, then Michigan would never receive any attention from the national campaigns. Our automotive, agriculture and tourism interests would be ignored. Everything would be focused on what sells in New York and California. We need Presidential campaigns coming into our state and spending money. Michigan needs the Electoral College to remain relevant. No More Games, Mr. President: Release Deep State Documents Now! ASSANGE IS A HERO! THE TRUTH SHALL SET YOU FREE! !